Cookees Drive-In 2010 Christmas Decorations! 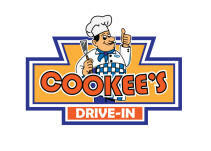 Our Third Christmas at Cookee's Drive-In 2010! This year, we went all out and decorated lots more on the drive-in, and lots more next door! These are a few pictures, and a short videos, showing the awning, and the window displays next door. the new additions this year. drivers as they pass by. a new addition to their area with Mr.
Click each of the Cookees logos to see a short video of our decorations in action! A new addition. GIANT Snowman! Another new one. Snowman Family.